A recent analysis indicates that hypertension is a highly prevalent, significant issue for physicians nationwide, including those practicing in emergency medicine. Since 2001, the emergency department (ED) component of the CDC’s annual National Hospital Ambulatory Medical Care Survey (NHAMCS) has collected data on blood pressure measurements recorded in ED settings. The CDC’s National Center for Health Statistics (NCHS) published a brief report on BP measurements at ED visits in adults using data from the NHAMCS ED. A significant finding was that elevated BP was more common at visits to the ED than at visits to primary care providers (Figure 1). The CDC report also indicated that both severely and moderately elevated BP at ED visits were most common among men (Figure 2) and older age groups. Severely elevated BP was more common at ED visits by non-Hispanic African-Americans (19.7%), followed by Non-Hispanic Caucasians (15.3%) and Hispanics (15.3%). Severely elevated BP was also more common at ED visits by Medicare beneficiaries (19.6%) than by those with private insurance (16.3%) or Medicaid (14.1%). Moderately elevated BP was more common at ED visits by uninsured and privately insured patients than by Medicaid beneficiaries, though this was not statistically significant. 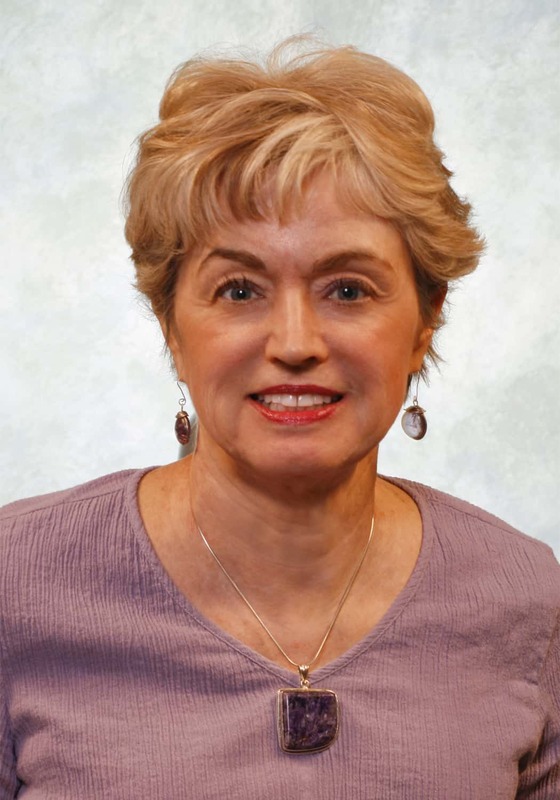 According to Linda F. McCaig, MPH, the higher rate of elevated BP at ED visits made by non- Hispanic African-Americans when compared with other racial and ethnic groups is likely attributable to a higher prevalence of hypertension in this population. Additionally, African-Americans had a higher overall ED visit rate (77 visits per 100 persons) than Caucasians (37 visits per 100 persons) in data from 2008. 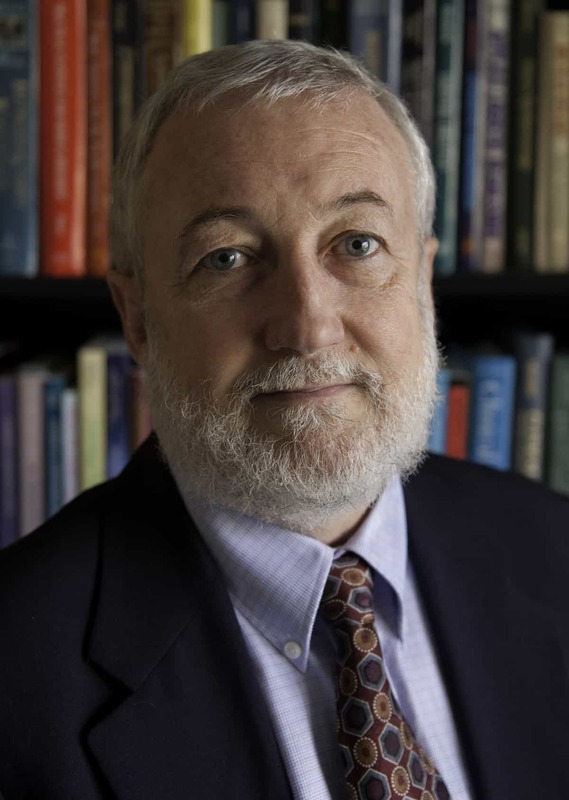 “This may indicate a lack of access to primary care, thus increasing the likelihood of having uncontrolled BP,” Dr. McCaig says. Niska RW. 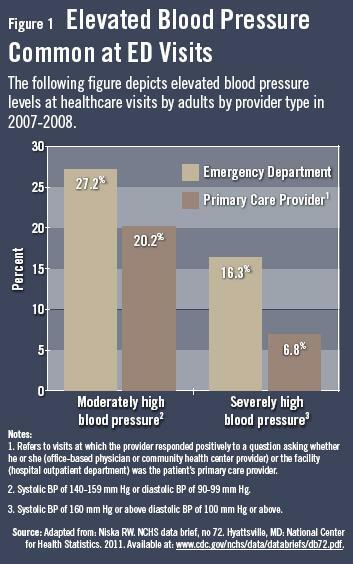 Blood pressure measurements at emergency department visits by adults: United States, 2007–2008. NCHS data brief, no 72. Hyattsville, MD: National Center for Health Statistics. 2011. Available at: www.cdc.gov/nchs/data/databriefs/db72.pdf. Egan BM, Zhao Y, Axon RN. 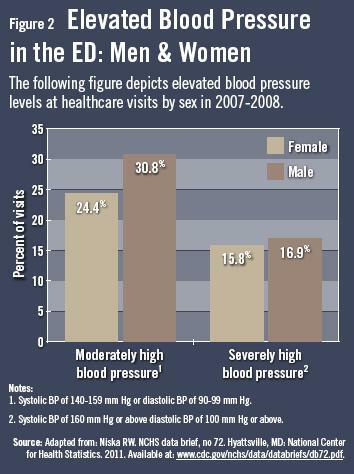 U.S. trends in prevalence, awareness, treatment, and control of hypertension, 1988–2008. JAMA. 2010;303:2043-2050. 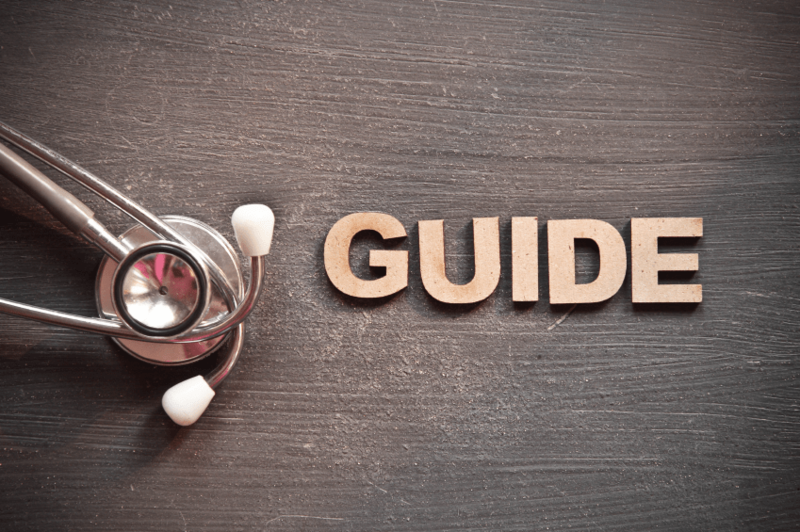 Decker WW, Godwin SA, Hess EP, Lenamond CC, Jagoda AS; American College of Emergency Physicians Clinical Policies Subcommittee (Writing Committee) on Asymptomatic Hypertension in the ED. Clinical policy: critical issues in the evaluation and management of adult patients with asymptomatic hypertension in the emergency department. Ann Emerg Med. 2006;47:237-249. Chobanian AV, Bakris GL, Black HR, et al. Seventh report of the Joint National Committee on Prevention, Detection, Evaluation, and Treatment of High Blood Pressure. Hypertension. 2003;42:1206-1252. Garcia TC, Bernstein AB, Bush MA. Emergency department visitors and visits: who used the emergency room in 2007? NCHS data brief, no 38. Hyattsville, MD: National Center for Health Statistics. 2010. Available at: www.cdc.gov/nchs/data/databriefs/db38.htm. U.S. Department of Health and Human Services. Healthy People 2020 topics and objectives: Heart disease and stroke. HDS–5.1 and HDS–12. Available at: www.healthypeople.gov/2020/topicsobjectives2020/objectiveslist.aspx?topicid=21. McCaig LF, Burt CW. National Hospital Ambulatory Medical Care Survey: 2001 emergency department summary. Advance Data from Vital and Health Statistics; no. 335. Hyattsville, MD: National Center for Health Statistics. 2003. Available at: www.cdc.gov/nchs/data/ad/ad335.pdf. Lind F. McCaig, MPH, and Stephen R. Pitts, MD, MPH, have indicated to Physician’s Weekly that they have no financial disclosures to report.